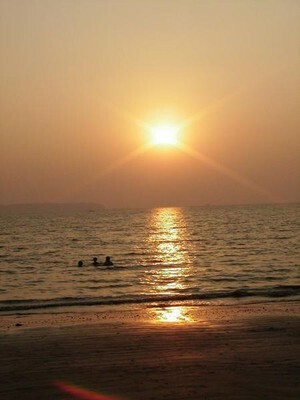 Goa is an ideal place to just chill out. Once you've seen Old Goa with its reminders of past Portugese rule, there's really only the beach - at least that's the case here at Bambolim. At some of the bigger and more touristy resorts there are discotheques and shops close by, but here there's only the hotel and a couple of beach bars. The day after we arrived - Tuesday 10 January I think - we went on the hotel's bus with other guests for a long afternoon and evening excursion. We stopped briefly at a Hindu temple, then continued to Old Goa. There, the clean wide streets, lawns and buildings had a distinctly European feel - not much of a surprise really as this was a Portugese colony until as recently as 1961. I believe it's now been dubbed a World Heritage Site by Unesco, so the buildings are well preserved. There is a large Christian community on Goa and the churches here in the old part rival many of the vast Catholic edifices found elsewhere in the western world. St Catherine’s Cathedral is the largest church in India and the Basilica of Bom Jesus holds the tomb of St Francis Xavier, the sixteenth-century missionary, and numerous other bone relics. I'm not quite sure what Pintu thought about all this, but he seemed interested to listen to my ramblings about Christ, the Last Supper and the Crucifixion, all of which were graphically depicted, sometimes with Indian overtones, inside the churches. We then went on the good ship Paradise for a cruise up the River Mandovi. For 100 Rupees (£1.25), hundreds of locals and tourists alike crammed onto the ship's three decks - the top one had a stage where folk dances were performed and where the master of ceremonies invited the audience to come up to dance to noisy modern Hindi and Western music (much waggling of bums and waving of arms in the air as the stage was small and the audience was huge!). On the other two decks were a bar and a disco. A lively hour's entertainment. I had all day Wednesday to myself, reading, walking on the beach, and writing a few notes. Pintu had been invited on a date (another 'first' for him) with an attractive Indian woman of his own age. It wasn't a great success unfortunately and he returned in the evening somewhat deflated. He said he could have spent the money buying books for his studies instead of wasting it on lunch and the cinema! I took him down to one of the beach bars for a consolation drink. Today, Thursday, we've had a lazy day, eating, drinking, sunning ourselves on the beach and swimming in the sea - the latter being yet another 'first' for Pintu. I managed to stumble on some concealed rocks and cut my hands and feet but, apart from that, it was fun. Pintu certainly enjoyed the female scenery - which at this hotel seems to be mainly uninhibited Russian women.